Co-Polymer Alloy (CPA) roofing is comprised of a single layer of white, reinforced membrane, 40-50 mils thick, typically mechanically attached to the building with plates and screws. 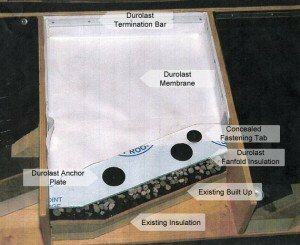 No gravel is installed over the membrane, which provides 86% reflectivity of UV radiation. The seams of the CPA roof system are welded together, not glued, providing a monolithic membrane upon completion. Its flexibility in re-roofing applications without tearing off the existing roof system has made it a popular choice with building owners. We offer both commercial roofing and residential roofing services. For more information please contact us.